Tell Us What Episode of GHOST HUNTERS Scared You the Most! OR – Your Ghost Story! 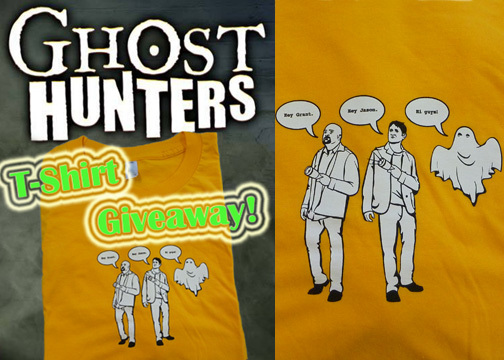 HOLLYWOOD JUNKET is giving away one “Ghost Hunters” T-Shirt from the Syfy network to one lucky winner who can give us the best example of why “Ghost Hunters” show scares you the most, or a real-life paranormal experience. We just want to be scared! Post it below in the comments section or log-into http://www.facebook.com/hollywoodjunket, “Like” us, then enter to win by leaving your comment on our wall. This contest is open to U.S. residents only, and ends on Wednesday, September 28, 2011. Enter below. Watch the new season of “Ghost Hunters” Wednesdays at 9/8 c on the Syfy channel. I was watching an episode and the two guys freaked out when they thought they saw a spider. I was laughing on my couch at how wimpy they were, ghosts are worse than spiders. And then, just like that, I see a huge black/yellow garden spider that had somehow made its way in my window…Lets just say I woke the landlord up. I know they can’t kill, but darn they are big. I have several overseas friends in Asia and Europe who want to win the T-shirt (obviously, the opportunity to win a T-shirt will gain international attention), but, sadly, the rules state “U.S. residents only” for this T-shirt (It must be due to shipping expenses, or…because we cannot let this T-shirt get into foreign hands-(the Russians, Chinese, or North Koreans might use the T-shirt to harm Americans). I am only 28 days from T-shirt victory, and I challenge anyone who dares top me. This is the greatest internet giveaway ever, and I am winning! John S.
When I first met my husband, he had a miniature pinscher from a previous relationship. We had the dog for several years, but had to have her put down due to her failing health when she was ten. Hubby always made it a point to remind me every now and again that Demi (the dog’s name) loved me more than I realized…which brings me to my story. She was a good dog, and that is an experience I will never forget. Blew me away for sure.